Do you know why I have named Galaxy Note 2 as the king of android.?? 1) 5.5" Super AMOLED capacitive touch screen. 2) Android 4.1 Jelly Bean, powered by 1.6 GHz Quad core ARM processor with 2GB RAM. 3) 8MP camera with auto focus and LED flash. 4 ) 2 variants of 16GB and 32 GB internal memory, expandable by up to 32 GB via micro SD card. 5) 3100 mAh battery, giving it the longest talk time among any smartphones in 2012. 6) Priced at just Rs 34,500 only in India. Now you tell me isn't is the best android Smartphone till now.Still you don't believe then have a look below. It has the best hardware as that of samsung SIII and the best part is that the phone provides more battery life and the battery is replacable.The phone is out of stock as soon as it comes to market. The phone is also best for heavy smartphone users. Some of the best apps are illustrated below whichI liked the most. 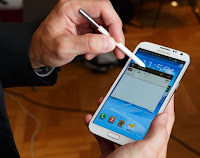 S Note: It's fun to get back to handwriting again, thanks to the Note II. The S Pen is a fantastic new accessory with integrated options.You can write like you do on note books. Air View: It is efficient to hover the S Pen over the display to scroll and view the details of calendar appointments. So it makes easy view for users. Angry Birds Star Wars: What can I say? I am a huge Star Wars fan and with the S Pen you can fine tune Han Solo's blaster aims. Google Play Movies: I enjoy renting and watching movies on my Galaxy Note II. Handcent SMS: This 3rd party SMS client looks great.Good interface too. Flipboard: This is the way to browse through your feeds in an interactive manner. Google Now: This utility is great for sports, traffic, package tracking, and more.